Minitokyo »	Cardcaptor Sakura Wallpapers » Cardcaptor Sakura Wallpaper: Groovy! So this is my new wallpaper for the war (va vs. evi). About the wallpaper: I try to find a mascot, it was not easy, because I didn't want to use Mokona, this was my first idea. For a mounth I build two Mokona (1 m big) for an animecon, so I didn't want to work with Mokona. So I choose Kero-chan for the wallpaper. I worked 5-6 hourse on the wallpaper, so this is the result. I hope you like it! Cutie way to go! Thanks for making such cute walls! And I can even sing it while viewing this wall. Wah...this was one of the only songs from CCS that I didn't manage to memorize...so I could only sing parts of it...T_T But this is a super cute wallpaper! Nice variation too! 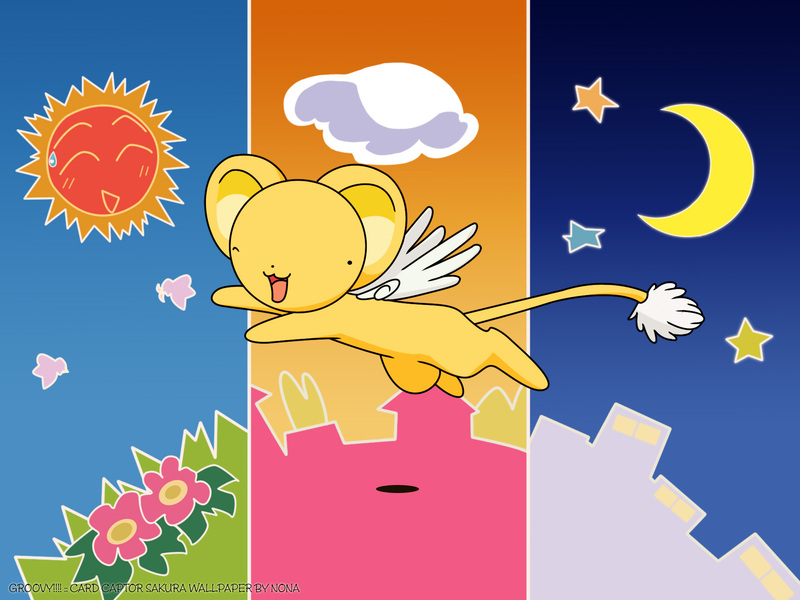 im looking at kero and hes jumping all around! SQUEAL! Kero! So adorable and cute... I like the different backgrounds... Very creative... Thanks for sharing! Nicely done with the colours.